We wonder if Henry Kissinger would have been able to work out detente between Samsung U.K. and HTC U.K. Back in March, both sides attacked the other's flagship Android phone with Samsung tweeting that "Four is always better than One". HTC tweeted a response, "Plastic is not fantastic". Both sides sniped at each other again on Friday and again the feud was made public on Twitter. HTC U.K. sent out a tweet reporting that the HTC One had won the award for 'Hottest Phone of 2013' at the Mobile Awards. 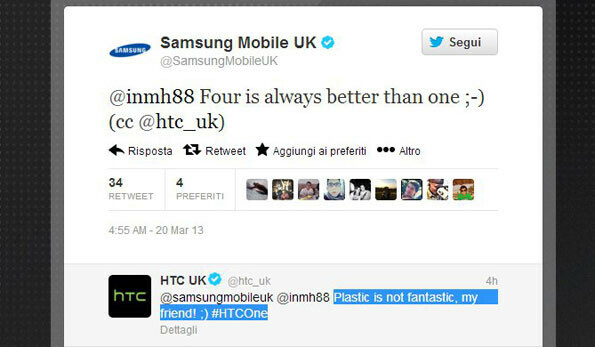 Samsung U.K. replied by saying that HTC could have that one award because Samsung walked away with three. To which HTC tweeted a crack about how all of those fake reviews about its competitors that Samsung had paid college students to write, were finally paying off. Fellow OEM LG decided to act like the only responsible adult in the room by sending a tweet to both Samsung U.K. and HTC U.K. that read, "Calm down dears! It's only a phone!" If LG can bring peace between HTC and Samsung, perhaps the manufacturer should see what it might be able to accomplish in the Mideast. But Samsung did indeed pay students for bad reviews on rival products. They deserve a little egg-on-face for that. Htc you're pathetic!You're lick Apple assss.Samsung have my respect, they fight with patent troll, but you..........One time I bought you're phone but never again. ppl was too dumb to continue supporting samsung. Even its been proven they cheat and manipulated the review. just like gsmarena, phonearena, etc. they used to call apple fans as iship. perhaps they are the bigger ship now. and HTC said it got an award, Samsung took the first jab with saying they let them have that one since Samsung took 3... didn't that make Samsung the childish one and thethird's comment also look childish? the fact that HTC ignited this issue bout winning that award. Not being biased. 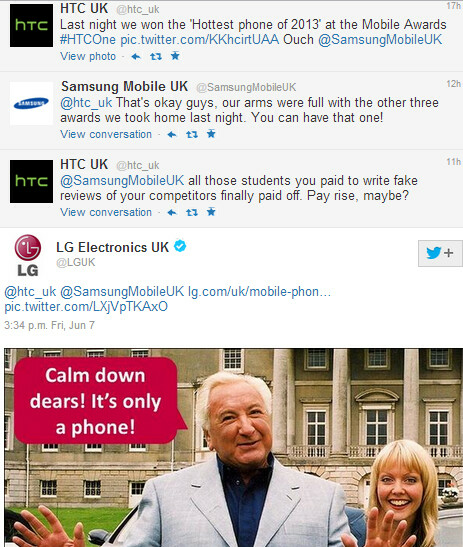 I know both companies are dissing each other but I think UK's Samsung and HTC twitter holders are childish. lol look at "@SamsungMobileUK" in HTC UK's first tweet. HTC seems to have started it. Because many of those defending Samsung are paid by Samsung. They were caught in Taiwan. And it is highly possible they are here right now defending the motherland so they could get paid! do you know this is reallllllllllllllly common on South Korea??? Whats the big deal this is very entertaining and pretty funny and no 1 is getting hurt i say keep it up! Isn't this a old topic ? LOL Silly LG. hahaha who is this guy? I like this guy. Haha HTC clinging on to the paying off reviewers thing and they still just can't admit that their product would still be 3rd place or lower, even with all the marketing and bought off reviews in the world. Google: All your Android are belongs to us! What they SHOULD be doing is directing all this energy at Nokia and Apple. You know, the two companies that keep taking shots at Android OEM's. Not bash each other when they're on the same platform selling the same core product. This is not about "the same OS". These are 2 companies who are directly competing with one another and the only thing they have in common is that their UI sits on top of Android. Like it or not, each Android manufacturer is in competition with one another just like they are with Nokia and Apple. There competition amongst each other is the reason you get 1080p screens, quad & octa core processors, boom sound, s-pen, etc. I say, let them wipe the floor with one another as long as they keep pushing the boundaries in the hardware and software department. Looking at the tweets, there was nothing mean spirited or evil about any of them. Now paying for fake reviews is a different story which has already been owned up to. Seriously, more examples of adults acting like kids... The same applies to both sides. Kids fighting, while SONY concentrate and produce more good products.